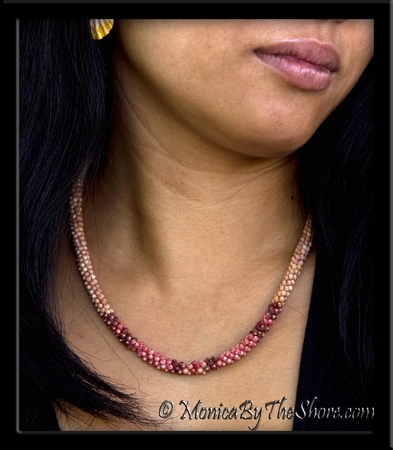 Poepoe style Kahelelani Shells Lei strung in lustrous pinks, burgundy & tan colors in this traditional rope style 18 inch necklace. White "bumpy" Granulated Cowries clasp finish the piece in an authentic "old time" style. Vibrant colors, beautiful pattern, true rare Hawaiiana! To make this traditional Hawaiian Niihau style Kahelelani Shell Lei even more customized, you may choose a special Sunrise Shell from my collection to be be incorporated as a centerpiece pendant! The cost of the added Sunrise Shell would be extra & would depend on the shell you choose. 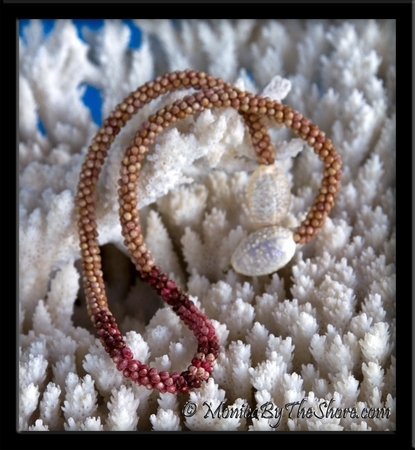 Unique, original Hawaiian Sunrise Shell and rare Seashell jewelry designs by MonicaByTheShore of Haleiwa, on the North Shore of Oahu, Hawaii.